Ahh, the day after vacation when you have to face reality. It can be so hard to get back into your normal routine when just a few days before you were somewhere fun. 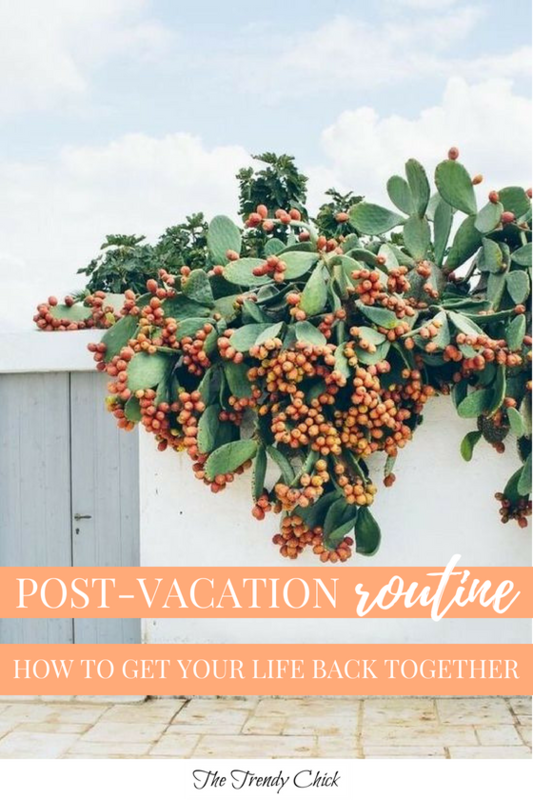 But it is important to get yourself back into your routine quickly and not just spend the whole week after vacation moping about the fact that you aren’t still on vacation. Today I am going to share my favorite tips for being productive and getting into a routine after your trip! No one like unpacking. But one thing I have found is that if I force myself to do it within 24 hours of returning, it is a lot easier. If I wait more than a day or two, I can pretty much guarantee my suitcase is going to sit untouched on my floor for the next 3 weeks. Plus, it feels great afterwards when all your clothes and washed and everything is put away where it goes. Chances are a few things piled up while you were out of town. Whether it is work, school, personal, or cleaning tasks, there are sure to be some things you need to accomplish soon. Don’t push yourself too hard the day after getting back, but you will feel a lot better about life if you accomplish your top 3 or 5 things at least. If you have been traveling, sometimes it is easy to not drink enough water, eat way too much junked, and not work out at all. When you return home, try to make a conscious effort that first day to workout, stay hydrated, and eat well! When I fly, often my skin gets dry and isn’t at its best. So I like to use to a hydrating face mask after I return to give my skin a little extra care! Especially if you were gone for more than a week, it is important to reach out to your friends when you return. They would probably love to hear about your trip, but you will also want to know what they were up to! By planning something fun you also have that to look forward to instead of dwelling on the fact that vacation was over. Take a nap, read a book, go on a walk, or sit outside for a few minutes. Do something for you that will make you feel more peaceful and happy. Chances are you have been exploring nonstop while on vacation and now you are getting thrown back into reality. But first, take a little time for yourself to recharge. What do you do to get back into your routine after vacation? Share any tips I missed in the comments below!